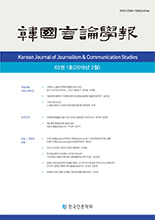 이재신,(2014).커뮤니케이션 채널과 메시지 해석수준을 이용한 비개인적 효과의 원인에 대한 탐구.한국언론학보,58(2),111-133. 본 연구는 미디어 관점에서 낙관적 편견의 발생원인을 설명하는 비개인적 효과 가설에 대한 탐구를 주 목적으로 한다. 구체적으로, 비개인적 효과의 발생 원인이 커뮤니케이션 채널 자체의 특성에 기인하는 것인지 아니면 메시지의 서술 방식에 근거하는 것인가를 해석수준이론을 적용하여 살핌으로써 비개인적 효과의 발생 원인을 탐구하고자 한다. 이를 위해 대학생들을 대상으로 2(커뮤니케이션 채널: 온라인 뉴스, 트위터) × 2(메시지 추상성: 추상적, 구체적) 피험자 간 요인설계를 통해 이들 요인이 빅 데이터 개인정보 유출 위험에 대한 낙관적 편견에 어떠한 영향을 주는가를 살펴보았다. 연구결과는 비개인적 효과 가설이 암묵적으로 가정하듯 메시지 추상성이라는 단일 요인에 의해 개인의 위험인식이 결정되는 것이 아니라는 점을 보여주었다. 이는 단선적인 인과관계 보다는 커뮤니케이션 채널과 메시지 추상성 등 다양한 요인의 상호작용이 위험인식을 형성함을 의미하는 것이다. This research examines the effects of the communication channel and message abstractedness on optimistic bias. The purpose of such an examination is to explore the origin of the impersonal impact. Specifically, prior research on impersonal impact hypothesis has reported that the communication channel plays an important role in individuals’ risk perception. However, it is yet unclear whether such impersonal impact is due to the characteristics of communication channel or the difference of the way messages are constructed in each communication channel. Hence, a two-way(communication channel: news, twitter*message abstractedness: high low) factorial design experiment was conducted in which 160 college students participated. The results show that message abstractedness played different roles in each communication channel in terms of forming optimistic bias. The results show that the construal level theory provides a valuable insight to understand the origin of impersonal impact.